! This is NOT a method of direct communication with FLOWERAMA #226 for purposes of ordering or rectifying problems. My flowers are just beautiful! The roses are fragrant and the greenery is still great , 4 days later. Beautiful flowers arrived for my opening night! I would not recommend this place to anyone. Sadly for the money you pay the quality is not there. Seems like no time was take to assemble the bouquet. Stems were not cut evenly and arrangement had no order. Absolutely disappointed with my experience. Thank you for taking the time to tell us about your experience. When we spoke on the phone yesterday we arranged to have a new one sent to you. I hope when it arrives, it meets your expectations. We are truly sorry you were not satisfied before and hope we have made it right. Those were the most fragrant and beautiful flowers I've ever received! They are still lovely 5 days later. This was an absolutely gorgeous arrangement. Even today the flowers are still beautiful. We are so happy you are enjoying them! Thank you for taking the time to tell us! 2 weeks later and flowers are still blooming and look beautiful!! The Boston fern was not available but you sent a croton. The wooden planter it was in was very nice and I am satisfied with the service. Thank you. Thank you for being flexible with the availability of the products. We are very glad you were happy. We appreiciate your business! Highest of praises to Flowerama for my mother's 80th birthday party! They customized sunflower arrangements for 8 dining tables, cake and sign-in tables. Also creatively designed L-shaped arrangements to decorate 4 lantern centerpieces too! Flowers were fresh, colorful, expertly arranged, economical and delivered on time with a smile. My mother was completely overwhelmed, and she has very high expectations and discerning tastes. Thank you for helping me pull off the most success party ever and for making my mother cry with joy! It was truly our pleasure! I got some beautiful flowers last week, and was really happy with the purchase. Although the sign on the outside of the store is dated and weathered, I was really impressed with the wide selection inside and how helpful the employees were. Thank you! Thank you so much for taking the time to give us your feedback! Glad you loved the flowers and service! Website was easy to use from Arizona! Flowers arrived quickly and the lady was thrilled with the freshness and arrangement. It was one if the most beautiful arrangements I've ever had!!!! The roses were hugh! Very pleased! Thank you for the fast and beautiful delivery! Everything was perfect! Flowerama's website was easy to use and the arrangement was beautiful and fresh. I forgot to sign the card and they offered to call the delivery driver to help rectify my mistake. Great service and great product. Thank you! Thank you for the review. We appreciate you! Excellent service! They called me to let me know they were coming and put it on the porch for me. So glad you were pleased! Thank you for taking the time to tell us! I received the most beautiful rose bouquet from your shop...absolutely beautiful!!! Thank you! It's so nice to hear we have a happy customer! This is a beautiful arrangement. Thank you. I wouldn't change a thing. They did not deliver until 6:00 PM after my wife had left but then they delivered a fresh arrangement the next day. They went above and beyond. Thank you. Thank you so much for letting us fix it for you. So sorry we missed the first time and we were glad to have the opportunity to try again. I ordered bouquets to be delivered to loved ones long distance. The first time I had flowers sent, I was surprised at the quality of the arrangement - healthy flowers, beautiful arrangement, sheer quantity - they actually made everything more attractive than the pics online, and it was delivered on time. Second round, same experience. 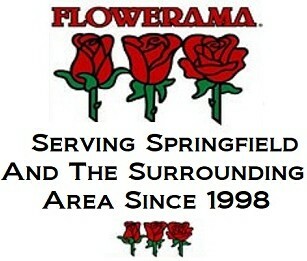 The only flower shop I trust to deliver fowers ordered online in the Springfield area. Thank you for taking the time to tell us you were pleased! So glad you were happy! We look forward to helping you again. We are so sorry. We will contact you via email about a solution. The flowers are beautiful and still look great days later. They were delivered to my office at the very end of the work day - around 4:50pm. The only negative thing about that is my husband was worried they would not arrive on time. We were both happy with the arrangement of flowers though. I am ALWAYS PLEASED with your flowers, the quality is outstanding! They last a long time no matter what type I purchase. There is always a decent selection in the store and of course on line. The prices in the store are a tad less expensive than other florist and your personnel is OUTSTANDING! The flowers were beautiful and more importantly -lasted a long time!! The flowers were delivered on time and were beautiful - just as described. Thank you! Thank you so much for the review. We are so glad you were happy! I love working with Flowerama! I ordered these on line and they were perfect lasted through the 2nd and ordered them before Christmas. Would have preferred to go to the store so I could get my card punched but did not have the time. They are TOTALLY awesome! THank you so much for thaking the time to let us know your were happy! So glad we could help! The next time your able to shop in the store, let us know about your online purchase so we can punch your card. Website orders are valid for card punches. See you soon! I ordered an arrangement online with the understanding it might not be exactly the same. The arrangement I ordered was a very full bouquet. The arrangement that was delivered looked pretty but extremely sparse. I did send them an email to resolve but no response. I would not order from them without first seeing exactly what you will be getting! Beverly, I am very sorry you were not satisfied with your purchase. I would like the opportunity to talk with you about it and see what we can do to improve. I am unable to find any correspondence in my email form you so I wanted to reach out by phone as well as from our reviews. I hope to hear from you soon. Awesome service! I ordered flowers same day and they were delivered speedily! Receipent was very pleased with the delivery. I was very dissatisfied with the plant arrangement that went to my sister-in-law's funeral. I was unable to attend but my mother took a picture of it for me and it was not what was advertised. I realized that it would not be the exact same but I feel that it was not even close to the quality pictured in the photograph. I would not use this service again. Thank you so much for your feedback. We are very sorry you were not happy with your purchase. We would like the opportunity to offer a soultion and diccuss this with you further. Please call us at 417-869-9890. Easy to order and very prompt delivery. Very satisfied. Beautiful arrangement! Couldn't be happier! The peonies were gorgeous. Thank you for creating this simple but beautiful arrangement. It was difficult to find anything similar. So glad it was just what you were looking for! Thank you for your order. As always, a great arrangement. Thank you for always being top notch. My wife loved the arrangement. My experience with Flowerama #142 was wonderful. I ordered flowers for a funeral as I am from out of town. It was a little last minute but Flowerama delivered the flowers shortly after I ordered them online. It was nice receiving an email confirmation that the flowers had been delivered. Thank you very much!!!! Flowerama has never let me down. Every time I have purchased flowers there (in store or now the few times online) they have come up with stunning arrangements. Thank you so much!! Same day delivery was quick and timely. The flowers looked just like the photo too! Thank you for taking the time to tell us about your experience! We love Brad! He's awesome! the flower arrangement was delivered last Friday and as of this morning still look as fresh as when I received. I would like to recognize Raleigh for the amazing service he gave me. He greeted me with a smile as soon as I walked in and provided me with personalized service. I only purchased a single rose. He went above and beyond by arranging it with greenery and filler so that it was vase ready. He was extremely helpful and knowledgeable. It was a pleasure to meet Raleigh, he is an asset to your floral shop. The ladies at Flowerama have never failed to produce top notch bouquets for me. The on-line ordering site was easy enough, once I realized I don't put my billing address for the delivery address. Other than that, no hiccups whatsoever. The poinsettia I ordered for my parents was beautiful. It arrived early on the day I chose and it was perfect! They are beautiful and still look fresh and blooming. One point is how do u keep them fresh longer. Always heard u put an aspirin in the water but what mg do u use. Glad to hear your flowers are lasting! Keeping the water clean and the stems freshly cut each day will go a long way in preserving the life of your bouquet. The ease of ordering online was very convenient. The flowers were delivered on time and as expected. Thank you. These flowers were very beautiful and they brightened my aunt's day. They received many compliments. My aunt received a lot of compliments on her flowers! Great job! Very pleased with the flowers. Very beautiful. Delivery time it was awesome. Made my day. Than you. Thanks for the perfect delivery, it really was a great experience all around. Great creative talent with florals. Wonderful staff. PR plus. exceptions handled with grace. Will continue for many more years. Thank you so much for the kind words! We love being your florist! My friend was very pleased with the flowers. Thank you! They were very beautiful, but they died after 2 days... Kind of wish I could have enjoyed them a bit longer. I liked everything except the color of the vase. I wanted another color plus the bow was the wrong color. The flowers were awesome. The delivery driver, Brad, went above and beyond! He did not have the letter of the apartment bldg. for my sister's flower delivery, so he called and asked if I could explain where it was of if I knew the apt letter. I did not but told him what kind of car she had and where it was parked, he found her and even called back with the letter so I would have it for next time. I thought that was a really nice gesture! Thank you so much for taking the time to tell us! We will let Brad know. He is awesome! I was very satisfied with everything! The ordering process was very easy. My local store phoned me a few hours later to advise they were out of the poinsetta I had ordered, so we discussed a substitute and I agreed. It was lovely. Flowers looked great and really cheered up my wife in the hospital. Thanks! Always great to deal with this location. I had a need to send flowers and they were delivered prompt and were beautiful. thank you! My mom loved the flowers! Your website was very easy to use. The arrangement I ordered was what was delivered and the recipient loved them. I use Flowerama for all our floral needs. They have a great selection at great prices. They never let us down. They called my to say there was a bad ice storm but they would try to get it delivered. I ordered day of and they delivered on Saturday. Well done. Thank you so much for taking the time to let us know you were pleased! Hope to help you again in the future! I was very pleased with timely delivery and beautiful bouquet. Thanl you so much for your order and taking the time to let us know how you liked it. These flowers were very important as they were to cheer my daughter up from a broken heart. They were delivered on time and she said they were very beautiful. Thanks for arrangin the flower delivery to Bolivar with another Florist. I didn't realize you didn't deliver there. Was great to get the message that you took care of everything. Thank you so much for taking the time to let us know you were pleased! We look forward to helping you in the future. You were very prompt with my delivery and my aunt was exceptionally pleased with the flowers. I love how the flowers were delivered to my workplace early in the day. They are absolutely beautiful! Enjoyed shopping on your site - beautiful flowers with a great selection. Thank you for delivering and I know my aunt will be thrilled! Delivered very promptly and my aunt was very much pleased! Thanks again! I ordered the sushi flowers for my bff. I actually work as a florist and have worked at a Flowerama! So, I asked her to send me a pic of them. The arr was very cute and looked close to the picture on the web. My only complaint would be that she didn't get any chopsticks! Well done though. Thank you! The website was very easy to use. I found exactly what I was looking for at a good price. It was very convenient to click a button and know that the arrangement was going to the correct place without me having to look anything up. I will use Flowerama again. The flowers were very beautiful and are lasting very well. I've ordered from FLOWERAMA before and they always hit it out of the park. 01.22.14, the 20th anni of Dad's passing, I wanted to send a bouquet to Mom, she always takes flowers out to him so it seems she should have some, too. I didn't even consider another florist. The flowers are always gorgeous & really last. She raved about them! Just yesterday, 02.10.14, she said she threw away the last flower. She was so impressed she called the shop to commend them on consistently superior product. Thanks so much, FLOWERAMA, for making it easy to make my Mom happy. You're the best! I always have positive experiences when dealing with Fowerama; but the incredible customer service I received with my last order was above and beyond any florist, or Springfield business in general, I have ever received. When a problem arose, the wonderful people at Flowerama not only contacted me immediately but offered to go the extra mile (literally!) to make sure my order made it to its intended recipient on her birthday. A huge thank you to everyone there at Flowerama! This is definitely the only Springfield area florist I will use from now on. Perfect! Arrangement was awesome and better than expected! Will definitely be using their service again ! The arrangement was bright and beautiful. Lovely flowers, very friendly delivery person! The flowers were beautiful. Delivery was scarey as they almost missed the bride. I had to call the florist to see where they were. But they were made the first stop on delivery route and everything turned out well. I hope the girl i sent them to loved them. I always used Flowerama back when we were together, so it was the only choice for this special occasion. They arrived early on Monday morning, and they were gorgeous. Loved the bright colors. Thank you! Being 600+ miles from home, it's nice to know my hometown flower shop it just a couple of clicks away on the internet. My mom was thrilled with the Mother's Day arrangement and candy assortment. I couldn't have done it any better...thanks to the great folks at Flowerama, Springfield, MO!!! The flowers were for my wife, and she loved them! They made all her female coworkers jealous. Thank you for making such beautiful arrangements! Great price, easy to order and my friend loved loved loved her bouquet! Excellent service and great fresh flowers. I've used your services several times. Thanks!! I ordered very late in the morning and needed a same day delivery and only had a few short hours to get it there. Not only was ordering online a breeze, but my order was delivered with time to spare AND the bouquet looked exactly like the picture I saw online. I will definitely use Flowerama again in the future!!! I never had a bad experience at Flowerama. Great service and excellent product. Exactly what I need from an online florist, reasonable prices and zero problems with delivery. HIGHLY recommended! My Mom loved the flowers, and even though I didn't order them until the morning of her birthday, she received them already early that afternoon. She said they were just beautiful, and the vase as she described it sounded even nicer than the one pictured on your site. I will definitely use your service in the future! I told my husband I did NOT want flowers, and what he did give was ABSOLUTELY Fabulous! I really like the gift basket idea over flowers. The flowers I ordered looked terrific and still do 3 weeks later! I was and still am very impressed by the service and quality of the flowers my perfect lady received! I will definitely be purchasing all my flowers from here in the future. Not much to say, I ordered the the flowers online, received early afternoon. Delivery person made my wife smile with funny comment. Great service!!! I've ordered lots of flowers for my wife in the past. This is the first time I've used you guys. And I am more than impressed! I will be using you guys again. Arrangement was beautiful, Thanks for listening to my specific comments and giving it a more masculine touch. Prompt and exactly what I was looking for. Wish I could have seen the modified arrangement I was getting online, but luckily I got to see it in person. A complimentary photo of "this is what you ordered" could be cool for online orders. I'd recommend you to others. The flowers were absolutely beautiful! They continue to open up and become even more pretty everyday! Thanks so very much! I can't say enough great things about you guy!!!! Awesome experience! Very easy to choose from great selection of plant arrangements with different prices. I stayed within an easy budget too! I live in different time zone and it was still delivered the SAME day! I will remember this services in the future - great service! The recipient of the flowers raved about them! Thank you so much! Easy transaction. Flowers were beautiful. Thank you for do this possible by sitting here in India. The flower and the gift was amazing. She is very happy by getting this surprise. Thank you again for those beautiful roses. It was an absolute pleasure dealing with you! The peace Lily was perfect and delivered right on time. I loved getting confirmation that it was delivered as well. Thank you so much for the delivery of the flowers to my Daughter-in-law. They were delivered by 9:30 a.m. on Christmas Eve day, you did good. She said that they were beautiful and was very pleased. Thank you, they were beautiful. The flowers were amazing, as they are everytime, I use Flowerama! The flowers were the talk of the school, and she screamed when she walked in her office and saw them! Thank you! Although I did not see the plant i ordered, I am confident it is exactly as I ordered Would use them again if the need arises. I am a deployed soldier in the middle east and your store helped me to get the flowers I needed to give my wife a happy anniversary. Thank you very much and I will be using your store again. I thought the rose was a little ugly, but everything else was really great and the card you picked was sweet. Beautiful Red Roses. Thanks so much for making my anniversary extra special. You guys are always AMAZING!! I always seem to be ordering flowers at the last minute and you always deliver them on time and on the same day, even if I only gave you a couple of hours notice!! GREAT JOB!! I will not shop anywhere else because of your dedication to serving your customers!! The flowers were beautiful and the persons receiving them have called twice to tell us how much they appreciated them and how beautiful they look in their home. Great job as always. The plant we ordered was for a funeral and we were not familiar with the area. We got to select was we were ordering for, then even got to select what location it was going to so we didn't even have to provide an address. The online ordering was very easy and we couldn't be more pleased! Order process was simple and quick, very satisfied. Flowers were beautiful and very fresh. The gentleman that delivered them was very nice and polite. Really was the most beautiful arrangement ever received, variety of flowers were perfect. I loved the vase they were in very nice arrangement. The whole office commented on how wonderful they looked and how it went very well togeather. I am very happy with the flowers thank you. I loved the colorful bouquet and large stems in the metal floral milk can type container. I wish the Gerber daisies would last longer, but removing them a few days after receiving them didn't harm the beautiful arrangement as it still lives on into day 10! I've ordered flowers from numerous florists in Springfield for my Mother. She said this bouquet was the most beautiful one I have ever sent her -- Thanks for making her birthday special. I liked how I received an email when the flowers were delivere, the distribution of the different up grades, the flowers were very pretty and had several positive feedback about them. The main factor was the price compared to other stores. I was so glad that flowerama was opened when I needed flowers. Thank-you for helping me. The stunning stargazers was just so beautiful and the arrangement was larger then I thought it would be which was just wonderful. Thank-you Wanda and the girls that helped me. The arrangement that I chose to have sent to my lovely grandmother that turned 80, was verrry much pleased. Thanks for your service. Denise / Fla. I know the flowers were appreaciated by the family of the deceased. They praised the "many beautiful flowers" in the arrangement. I was worried because I could not spend a lot of money; however, the arrangement was larger than what I expected and just beautiful. The all white flowers really stood out among all the other autumn arrangements. I will definitely use your services again. Thank you. Everything was so easy, flowers delivered on time and looked great. Great service. Friendly people. I will order again. The flowers were very nice. My only complaint is that they were not delivered until after 3:00pm to my wife's workplace. Some type of notification of when the flowers will be delivered would be helpful. The flowers came as I requested, when I requested. It was a very good transaction with great communication. Beautiful arrangement and the delivery man was very nice and friendly. It was absolutly georgous. It was so bright and colorful and fresh it lit up the room. My wife enjoyed the flowers very much, they were very fresh and beautiful. It was actually great....The flowers were a great hit and they had to contact her job and did it without alerting her....Thanks! When you are in an absolutely beautiful distance relationship, what better way to surprise a princess than having flowers delivered to her... :) Thanks Flowerama! Keep up the good work! The flowers were beautiful - thank you! My sister loved the "sushi" flowers. I live in Pa and needed to order something for my daughter for her birthday...a birthday we actually share...and so I searched the web to find a florist in her area....your prices were the best and the ivy was the perfect gift for her. she absolutely loved it...and the balloons as well...and even though I did not pick the balloons...they were just right....and I could not believe how quickly they were delivered. I was tickled pink with your service and have bookmarked you site for future floral gifts for my daughter.